Many more consumer electronics devices will become part of the typical home network, as the Internet of Things (IoT) phenomena gains momentum. Meanwhile, the desire to create intuitive home spaces continues to increase, which in turn creates opportunities for more vendors to gain a share of the smart home market. 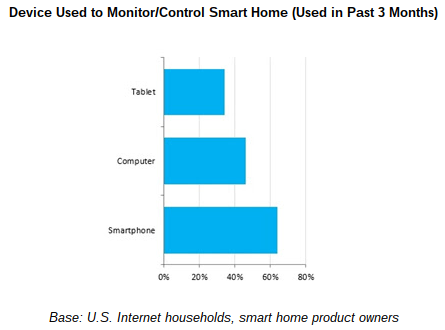 Nearly two-thirds (64 percent) of smart home product owners used a smartphone to control or monitor their home automation devices, according to the latest market study findings by The NPD Group. Additionally, 73 percent of smart home owners already use voice commands, with 61 percent of those consumers expressing an interest in wanting to use voice to control more products in their homes. "This reliance on smartphones to control and monitor the smart home is due, in part, to app compatibility, as nearly all home automation devices have an iPhone or Android app,” said John Buffone, executive director at The NPD Group. NPD believes that as apps and devices become more intuitive, voice recognition -- and thus, voice control -- will begin to play a more prominent role in the further development of the smart home. In line with the momentum to automate and control the smart home, The NPD Group has also recorded that Home Automation sales are up 41 percent year-over-year in 2015 versus 2014. Their tracking service metrics incorporate systems controllers -- such as thermostats -- and also the broad range of smart capabilities across technologies like power, sensors, lighting, security or monitoring and locks. In addition to wanting compatibility, consumers also desire convenience, evidenced by the increased usage of voice commands in the smart home market -- and, demand will grow as the majority of smart home product owners have indicated their desire to better integrate speech recognition technology throughout their homes. Rising to meet consumer demand is a new product set that showcases the functionality of voice command technology, such as the Amazon Echo, which leverages voice controls to turn on a Phillips Hue bulb or change the temperature settings on an Ecobee thermostat.